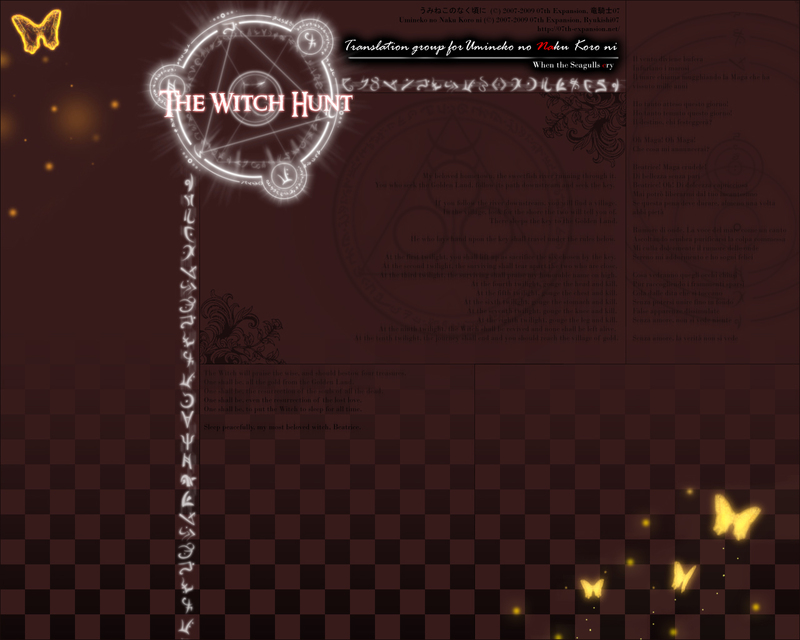 Witch Hunt is a fan translation team dedicated to translating the game/novels produced by the Japanese doujin group 07th Expansion. Head over to the Getting Started page to learn how to buy these games and download our patches. No patch files linked to on this site may be used without a purchased copy of the game! We are definitely not here to help people steal these great games, so all of our patches require a full version of the game to run. Fortunately, 07th Expansion is a doujin group, so their games are fairly cheap. Now that 07th Expansion has created a download version for all of the games we've translated, they're even cheaper and easier to get than ever. So please, support the incredible people who made these games and buy a copy! Welcome to the home of the Umineko English translation!